MixVibes recently announced the latest update to its CrossDJ software. Loaded with innovative features, a modular user interface, a brand new sampler and stunning effects, CrossDJ 2.0 has been specially developed to help DJs of all levels realize maximum creative potential. MixVibes has been releasing professional DJing software for the last 10 years and is the company behind CrossDJ, CrossDJ for iPad and Pioneer's Rekordbox. CrossDJ is a pro software, offering DVS and is compatible with most of the market's MIDI controllers. It works with Mac and PC. CrossDJ 2.0 opens new doors to creativity with the addition of two 8-pad sampler decks. A fundamental component of modern composition and performance, this new feature enables hot samples or favourite sampled beats to be incorporated in a live mix. Due to the fact all DJs are used to making transitions between the left and right deck, MixVibes’ new LINK concept couples each sampler to its respective player. 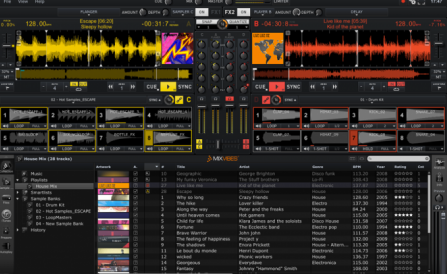 Don’t worry about mis-launching samples, CrossDJ’s LINK makes sure all events will be following the related deck. Its new quantize facility means all hot cues, loops or samples will be spot on, even if played slightly before or after the beat. The quantize function can be applied to either a player or a sampler. When activated, rhythmic errors disappear and the audio mix will flow seamlessly. The update also offers a powerful control of CrossDJ 2.0’s 14 audio FX, thanks to two new FX units with FX assignation and the ability to change the depth of an effect as well as the amount applied. A new bipolar filter is included, which can be directly accessed via a separate mixer control. For more info and full feature list, check out: http://www.mixvibes.com/content/products/crossdj.